Published today in Science is a perspective on the current fate of flying foxes on islands that Christian Vincenot, Vincent Florens, and I put together. Island flying foxes were recognized as a group of conservation concern over 30 years ago when intense hunting and commercial trading of species on Pacific islands precipitated the extinction of at least one species (the endemic Guam flying fox) and led to dramatic declines in others. This resulted, in 1989, in all species of Pteropus and Acerodon (flying foxes) being included on CITES (Convention on Trade in Endangered Species) appendices that restrict or regulate international trade. 30 years later, flying fox populations on islands are still declining because of hunting and habitat loss, and new issues, notably conflict between bats and fruit growers over crops have arisen. As the Old World Co-Chair of the Bat Specialist Group of the IUCN’s Species Survival Commission, I have been directly involved in efforts to resolve the conflict in Mauritius. The conflict has led the government of Mauritius to implement two mass culls of the species in two years (see article). In 2016, Chris, Vince and myself contributed to a special symposium on the Conservation of Island Vertebrates at the 2nd International Conference of Island Evolution, Ecology and Conservation. We were all presenting on issues facing flying foxes on islands and realized it was time to see where we stood 30 years on. As we suspected, tragically the status of flying foxes on islands has worsened and urgent conservation action is needed. Ain’s wonderful paper entitled “Resource availability and roosting ecology shape reproductive phenology of rain forest insectivorous bats” is available online in Biotropica DOI: 10.1111/btp.12430 (or you can request through my Researchgate page). 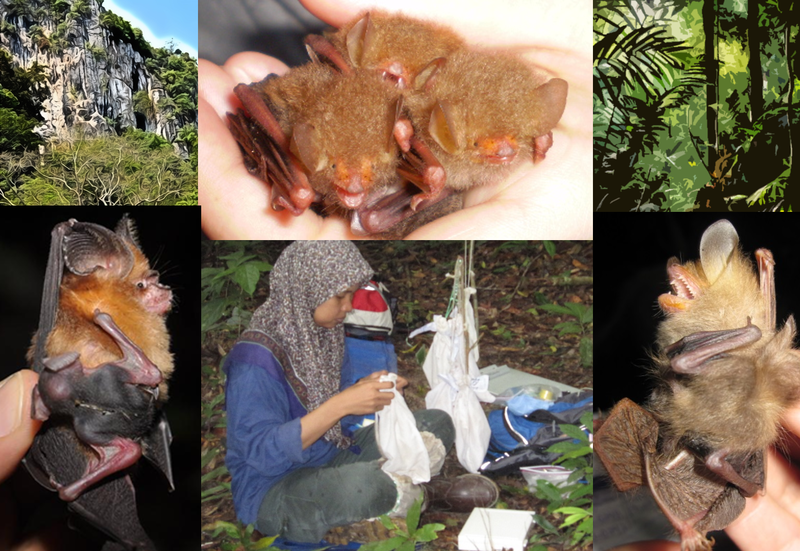 Ain spent 20 months tracking reproductive activity in 11 species of female bats in a Malaysian rainforest, and is the first study to simultaneously track both available insect biomass and local weather. The findings show different reproductive patterns in cave- vs. forest-roosting bats, which we suggest may be attributed to the cost of commuting. Ain hard at work in Malaysia, assessing reproductive status of cave- (bottom left) and forest-roosting (bottom right, top center) bats. Well done indeed to Ben and Iroro — recipients of 2016 Student Research Scholarships from Bat Conservation International. Only 17 awards were granted, so they did a great job. Iroro’s project is entitled “Ecological predictors of forest interior insectivorous bat habitat and conservation of the vulnerable Hipposideros curtus” and she received special recognition as a “Women in Conservation Science Award Recipient”. Iroro is out in the field even as we speak. Ben’s project “Conservation assessment of Rousettus aegyptiacus: hunting effects and ecosystem services in southern Nigeria” is off to a flying start — he heads to the field this summer. The Kingston lab would like to express its sincere thanks to Bat Conservation International for their support, and congratulations to all this year’s recipients — some great work going on! Before Marina started working on spatial bias in species distribution models and the SEABCRU database, she spent a couple of summers exploring the efficacy of driven transects in detecting bats in the low bat-density habitats around Lubbock. In our arid, largely treeless, waterless plain (the study was conducted during a 4-yr drought), stationary bat detectors remain silent, and pretty much the only way to detect bat activity is by extending the spatial extent of sampling by driving. This has implications for others surveying and monitoring bats in arid environments, and her findings are out this week in the J. Arid Environments. This is open access until December 9th. 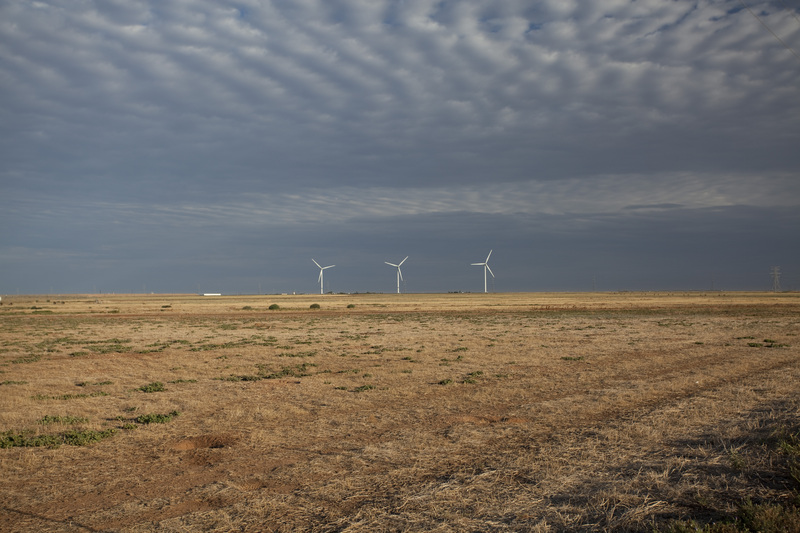 Treeless, waterless plain, where turbines abound. Driven transects work better than stationary points for detecting the little bat activity. The first publication from Kendra’s dissertation came out online in July, but it is out this month in the September issue of Biological Conservation. Phelps, K., Jose, R., Labonite, M., & Kingston, T. (2016). Correlates of cave-roosting bat diversity as an effective tool to identify priority caves. Biological Conservation, 201, 201-209. 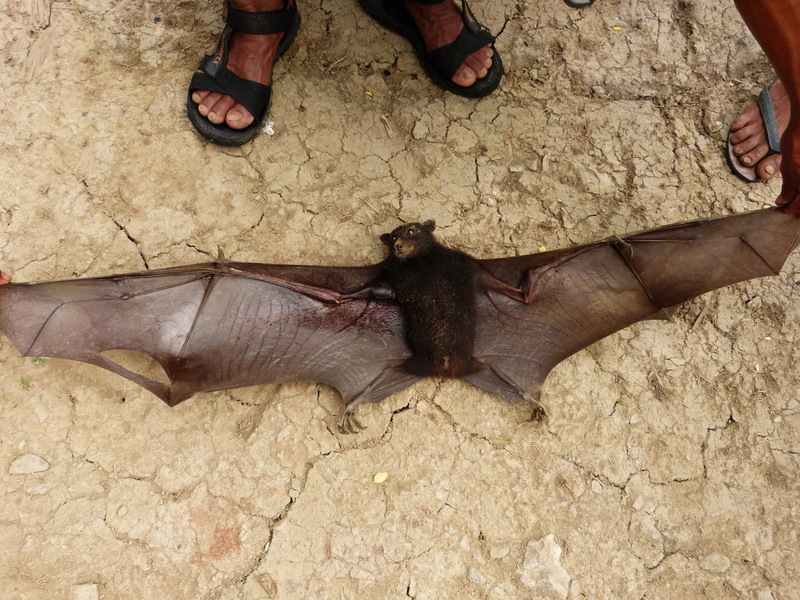 Correlates of cave bat diversity were used to develop cave – prioritization schemes. Surface-level disturbance and cave complexity correlated with bat diversity. Prioritization schemes selected caves with greater richness than random selection. Open-source data and/or rapid cave surveys can prioritize caves for conservation. Tigga and Iroro then headed to the 5-day Bat Conservation Africa Workshop for young African researchers that Iroro had organized. It was a wonderful opportunity to meet the young talent of the continent, and share experiences. Iroro did a great job pulling it all together! Kendra successfully defended last Wednesday — yay! Her dissertation title is “Response of Cave-roosting Bats to Complex Environmental Gradients: an Assessment across Assemblage-, Species- and Population-levels”. The first chapter is in revision for Biological Conservation, which is great. Thanks to her committee members Nancy McIntyre, Bill Resetarits, Jodi Sedlock, Rich Strauss for their service and support of Kendra. Thanks also to Richard Stevens for acting as Dean’s Rep.
Special Issue in Diversity “Diversity and Conservation of Bats” — submissions wanted!